It’s no secret that I don’t get along very well with the heat. However, I’ve learned to embrace it as much as you can while still harboring illogical dreams of somehow altering the rotation and tilt of the Earth so that Iowa becomes the ideal climate for my particular preferences. Perhaps once they conclusively get the whole God Particle thing figured out, CERN can turn their attention to my needs. In the meantime, I’m always on the lookout for new cooling and hydration options. If only the LHC could work for me! I’ve been thinking about my upcoming 50-mile run along the RAGBRAI course in a few weeks, and about how I will do my best to beat the heat. In addition to carrying plenty of water and hydrating, along with electrolytes and proper nutrition, my clothing choices will also be important. After riding RAGBRAI last year, I’m prepared for the fact that I’ll be out in the sun quite a bit, with very few shade options. Thus, I began looking at arm coolers to supplement my attire for just such a hot weather run. I first read about arm coolers in the context of runners tackling the Badwater 135. Ironically, I’m now watching Running on the Sun while I write this post. After doing my usual high level of research, and reading numerous reviews of arm coolers, I settled on he CEP Arm Coolers and pulled the trigger on Amazon. For those of you unfamiliar with the concept, arm coolers look almost identical to arm warmers that you may wear in colder weather. They come in handy because they allow you to stay warm during the beginning of a run, but remove them when the temperature rises. Unlike the warmers, arm coolers are designed to help keep your arms and the rest of your body cooler during hotter temperatures. 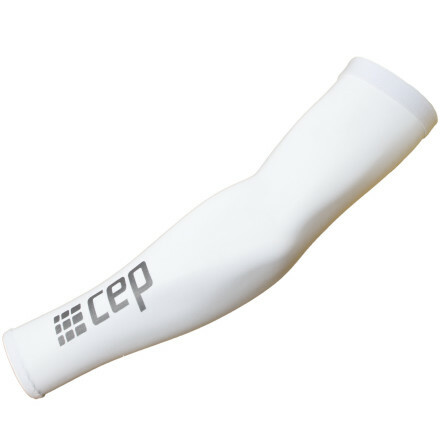 The CEP arm coolers are 90% polyester, and 10% spandex, and have a light, then feel to them. The pair I bought came in white, and although they aren’t initially see-through, they become see-through when they get wet, to give you an idea of the thickness of the material. The result is a high-wicking fabric, with UPF 50+ sun protection, and “cool-cell moisture activated skin cooling technology”. I was a bit skeptical of the cooling properties at first, but figured they would at least be a sun-blocking asset. After taking them out for several runs in 90+ degree weather, I am thoroughly impressed and a new disciple of their usefulness! After only a few miles, the sweat was building up, but my arms felt relatively dry, and it was nice not to feel the sweat running down my arms. When I’m in town, I like to plan my routes around he wonderful park system in Ames and the water fountains they house. At my first stop, I soaked my arms in cold water. The arm coolers absorbed more water than I thought they would, and dripping was minimal. When I headed back out to continue my run, they worked their magic. My arms felt noticeably cooler, and they hit the pressure points on my arms, which had the effect of cooling and relaxing my core as well. They continued to do their job admirably for several miles, which ended up being ideal for the water fountain stops I had planned. About to head out for a test run! As far as fit is concerned, I was quite happy as well. They have an elastic band that fits over the bicep to hold the arm coolers up, and this worked well to prevent them from slipping down my arms (which happens a lot with the Northface arm warmers I have). They hugged my arms comfortably, without being constricting. CEP is known for their compression gear, but these arm coolers are not meant to offer compression. The length worked well for my arms as well. From armpit to wrist, my arms measure 22 3/4″, and a size medium came to the midpoint on my biceps very nicely. I have relatively skinny arms however, so if you have a bit more circumference, you may want to consider moving up to a large. All-in-all, I’m quite pleased with these arm coolers, and would certainly recommend them to anyone looking to cool off in the hot sun or keep the sun at bay. My only caveat is that you make sure you get them wet in order to truly reap the benefits. They’ll do the trick as far as keeping the sun out, but they need some moisture in order to cool you down. 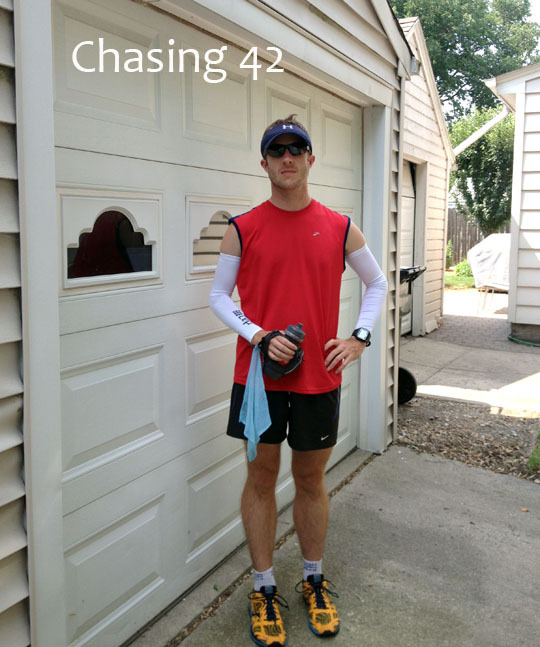 This runner’s Irish-German pasty white skin is certainly thankful for the protection! This is great! I was wondering whether these were worth the expense! Thanks! I’d definitely say go for it!